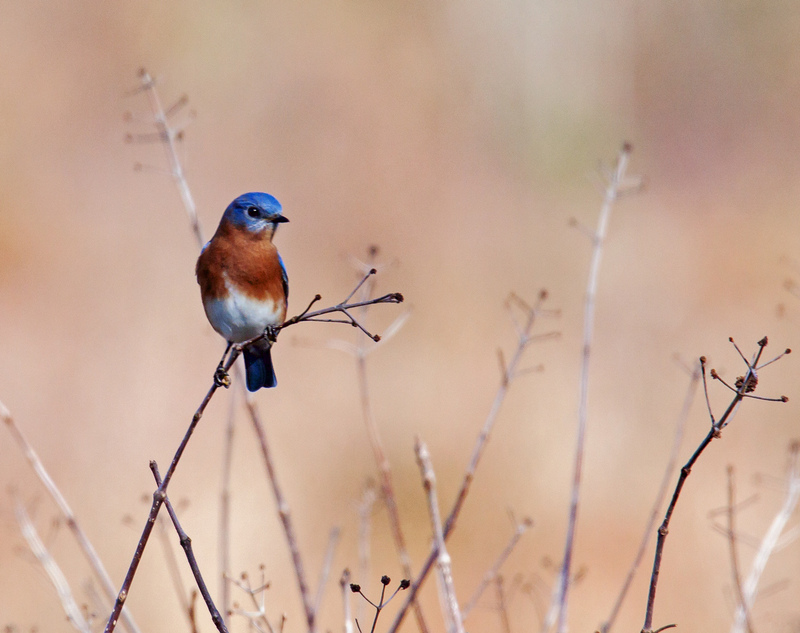 Last year several of my most popular postings featured Eastern Bluebirds (Sialia sialis). In response to one of those postings, one of my youngest followers, Benjamin, asked his grandmother why they were not called Orange Bluebirds, because the birds’ bodies seemed to have as much orange as blue. I appreciate all of the comments that viewers make, but that one comment has particularly stuck with me and it comes to mind whenever I see a bluebird. 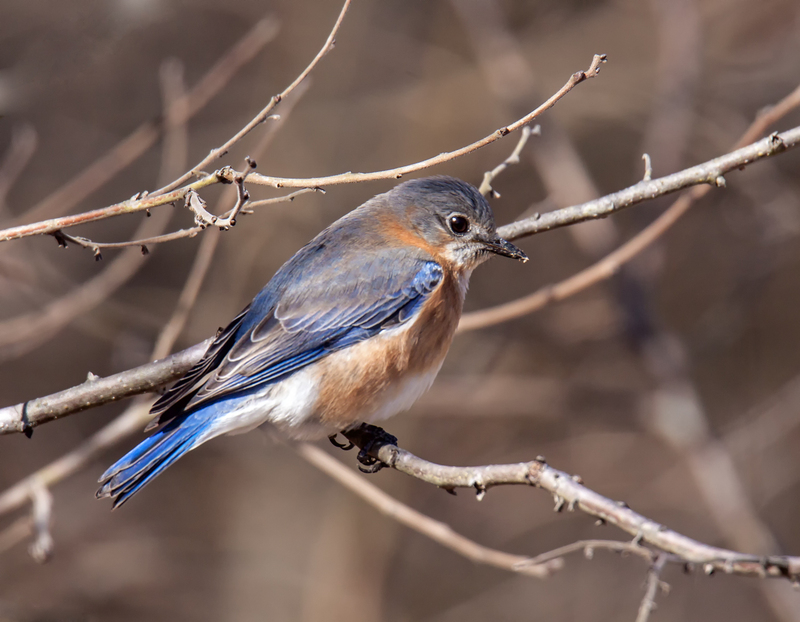 On the last day of February, I spotted several bluebirds at Occoquan Bay National Wildlife Refuge, my first sighting of the species in 2019. I was pleased to capture this image that shows some of the subtle coloration of one of those bluebird, with wonderfully varying shades of blue and orange. 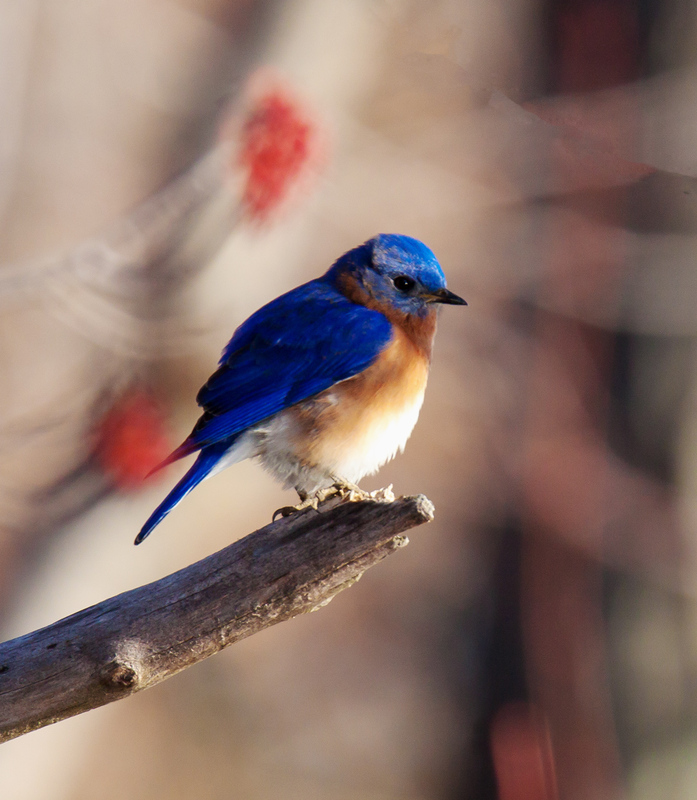 As I was poking about on the internet looking for information on bluebirds, I came across a sweet little song by Paul McCartney and Wings called Bluebird. The song was on the album Band on the Run—I remember the album, but don’t recall having heard the song. If you want to hear the song, check out this link to the song on YouTube. As a sneak preview to the song, here are the lyrics to the first couple of stanzas, as found on the website of The Paul McCartney Project. From a distance I spotted a flash of white, high in the uppermost branches of a tree. It was vaguely bird-shaped, but I had to move closer to know for sure—I am often fooled by misshapen branches or clumps of leaves. 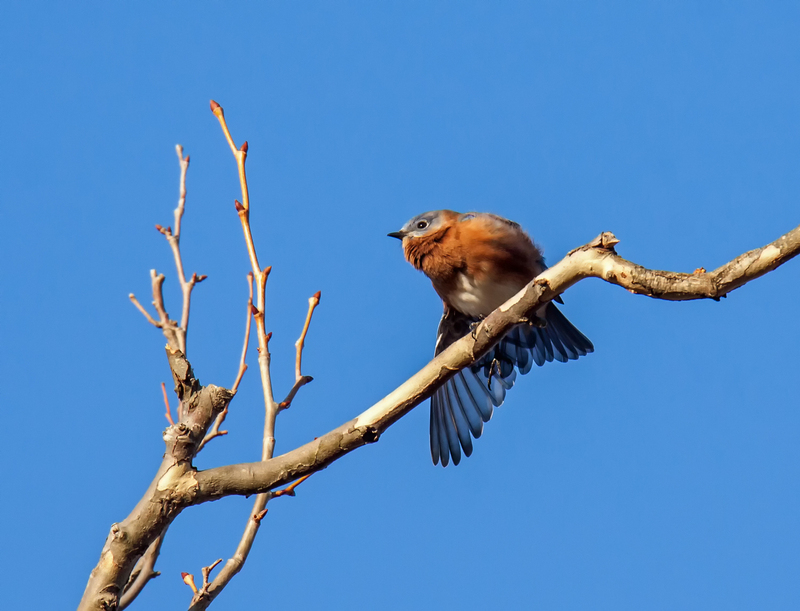 Eventually I was able to determine that what I had seen were the white breast feathers of an Eastern Bluebird (Sialia sialis) grooming itself in the early morning sunshine. 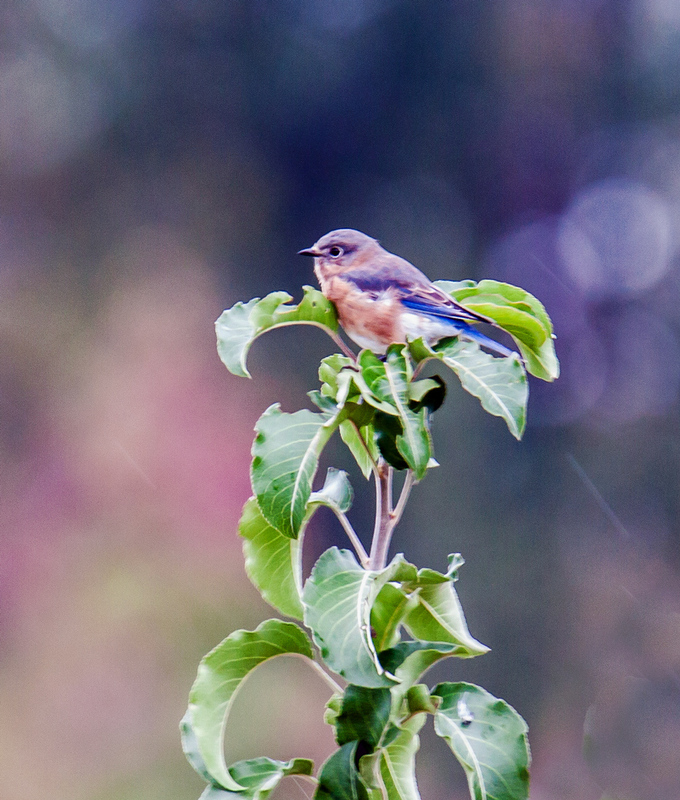 I love bluebirds and they invariably bring a smile to my face, especially when I recall the words of Benjamin, a young viewer of my blog, who remarked that these birds should be called “orange bluebirds,” because they have as much orange as they do blue. I love the tranquility of the early morning, especially when I am alone with nature. It fills me with a sense of inner peace and helps me to slow down and appreciate better the world around me. 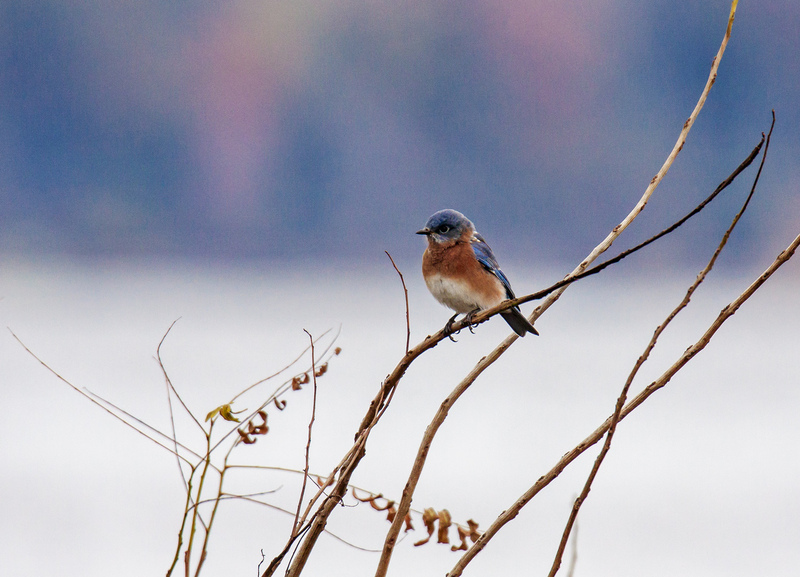 It is difficult to convey that inner feeling in a single photo, but this image of an Eastern Bluebird (Sialia sialis) from last week at Occoquan Bay National Wildlife Refuge comes pretty close. The bluebird was perched on some reeds in the middle of a marshy field. There was no way that I was going to be able to move closer, but I was ok with that. I focused on capturing a sense of the bird and its autumn environment and I am pretty happy with the way that the shot turned out. Some days the birds seem to keep their distance from me, so I do my best to capture modest images of them in their environment, like this Eastern Bluebird (Sialia sialis) that I spotted in a field last week at Occoquan Bay National Wildlife Refuge. I hesitated a little about posting this image, but I kept coming back to it when I thought about the shots that I wanted to share. I could enumerate technical reasons why this is a somewhat flawed photo, but there is something about the mood of the image that I find appealing. In the end, I decided to follow my basic approach of posting images that I like and letting others decide for themselves how they feel about the shots. Initially I couldn’t figure out what large insect this Eastern Bluebird (Sialia sialis) had captured on Friday at Occoquan Bay National Wildlife Refuge. When the bluebird turned to the side, however, I realized that it was a Handsome Meadow Katydid (Orchelimum pulchellum), one of my favorite insects. 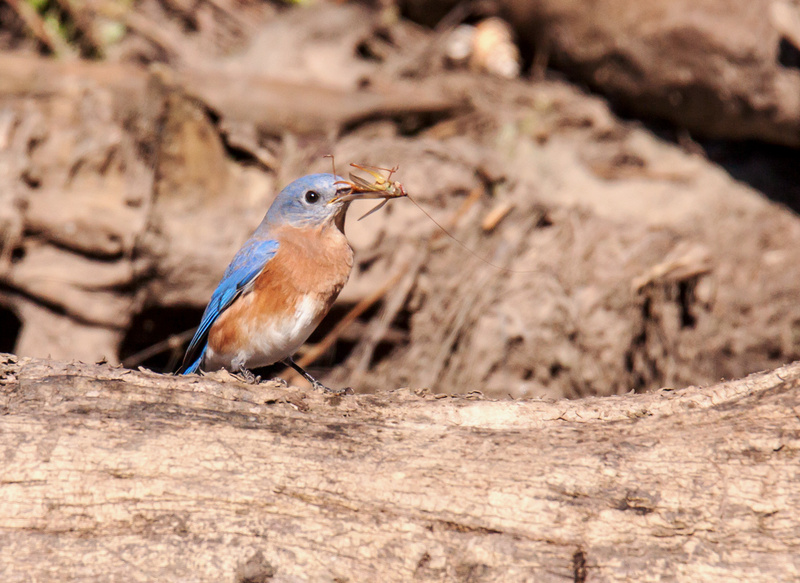 The bluebird beat the insect against the log on which it was perched, presumably to subdue the katydid or to break open its hard shell, before consuming it. 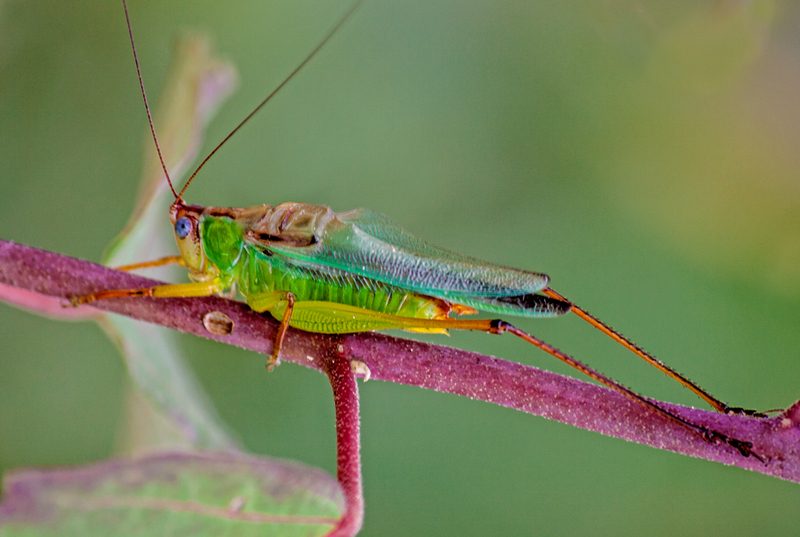 It is hard to truly appreciate the beauty of the multi-colored katydid from a distance, so I am including a close-up photo of a Handsome Meadow Katydid from a posting that I did in August 2013 that was entitled “Rainbow grasshopper.” Check out my thoughts and feelings in that post about one of my initial encounters with such a katydid. Still, bluebirds have to eat too, so I experienced only a brief moment of sorrow at the demise of this beautiful little creature. When the lighting is perfect, the blue and orange colors of an Eastern Bluebird (Sialia sialis) are incredibly saturated and beautiful. 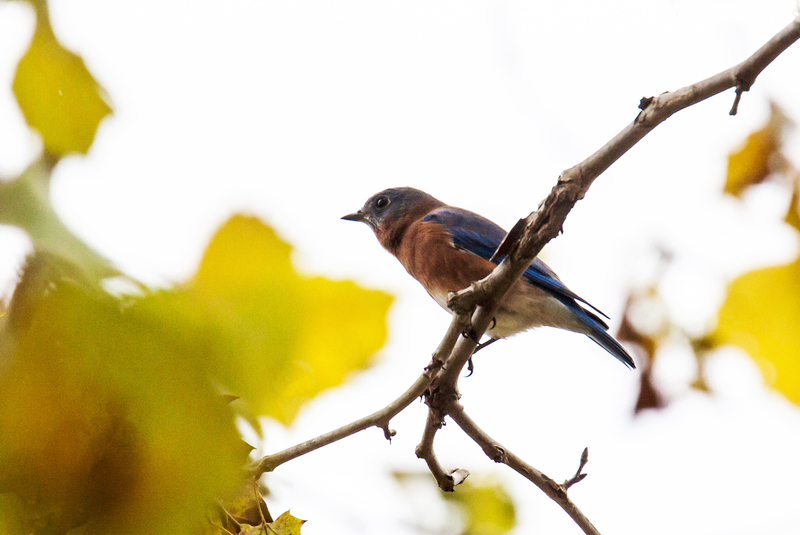 Alas, lighting conditions were far from ideal when I spotted three bluebirds earlier this week at Occoquan Bay National Wildlife Refuge and the bluebirds were elusive. I was able to capture some images that give at least a hint of the beauty of the bluebirds, a species that I am always happy to see. 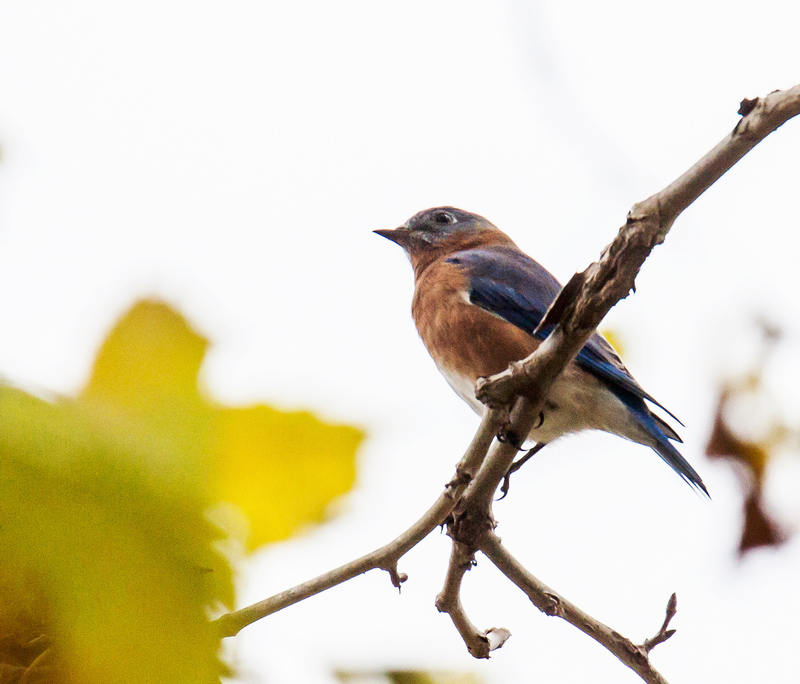 Most colors in nature are so dull and dreary during the winter that it is actually startling to see the bright spring plumage of some birds, like this brilliant blue Eastern Bluebird (Sialia sialis) that I encountered this past Friday. Some of the trees are now putting out buds and blossoms in my area of Northern Virginia and the blurry blotches of color that you see in the background are from one such tree.